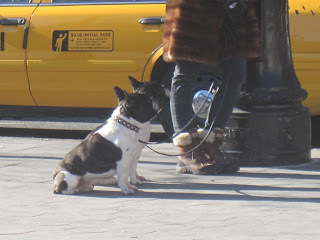 It's been a while since I've brunched, so when Holly P rounded up some troops a few weeks ago, ABF & I met up with them near Union Square. 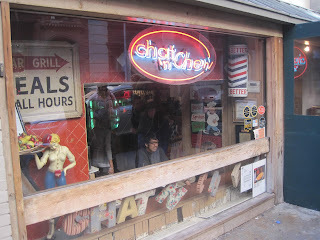 We hit up Chat and Chew, a restaurant I'd frequented often in the past. It had been years, though, since my last visit, so I was game to hit it up again. 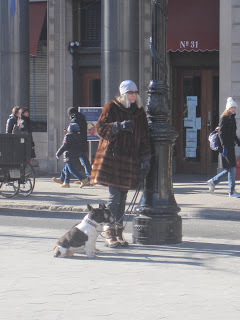 We met early (for brunch, anyway), just after 11am on the 16th street location. I'd never been here for brunch, just dinner (their macaroni and cheese is famous, and for delicious reason). 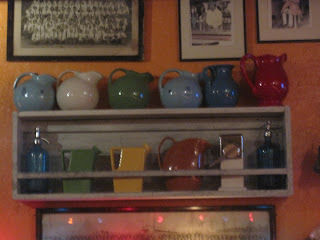 The decor is very kitschy, nostalgic, and anything else you want to call it: Fiestaware pitchers line a shelf on one wall, old-time slogans and posters are up all around, collectible train sets and soda bottles and just about everything else are all over. It makes for some interesting scenery. 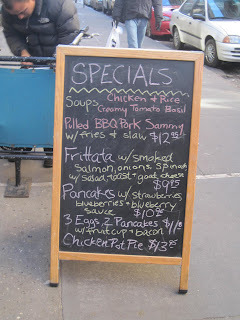 The brunch menu was overwhelming to me--so many choices (and yes, the mac and cheese is available then, too). I finally settled on a frittata, even though I don't normally LIKE them. It was the special--and it came with smoked salmon, baby spinach, and goat cheese. Trifecta! Beth L also ordered the same thing, and she was definitely a factor in my choosing--I was hemming and hawing until the last moment, but oh was this worth it. 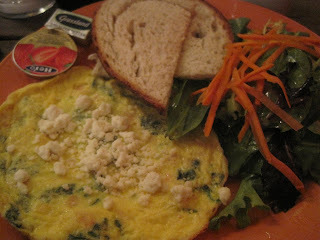 Unlike most frittatas I've had, this one was thin, light, and not at all heavy. It was delicious. Just enough food to fill you up without making you feel like you needed an 8-hour nap. ABF ordered the blueberry pancakes. 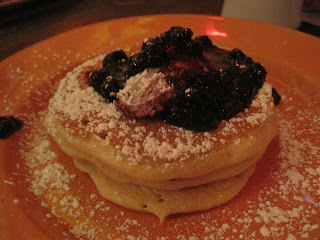 I tried a bite, and the sauce was fantastic, but the pancakes themselves were a bit heavy and tough--I think someone definitely worked this batter a little too long. I would suggest you not order these--ABF was definitely not a fan, and neither was I. They had an interesting list of cocktails, including a beer mimosa (Miller Lite and orange juice)! Two of the guys in our group ordered this and seemed to really like it. It was not a mimosa kind of morning to me (and I'm not really a beer drinker), so I just stuck to coffee, but they did have an extensive list of boozy brunch drinks! While the food was good, but not great, the company was outstanding. We laughed uproariously more than once as we all caught up on each others' lives, and there were a few moments where I know we were the loudest table in the room, but we were having so much fun I just didn't care. That was a great couple of hours--thanks to Holly P for organizing it!